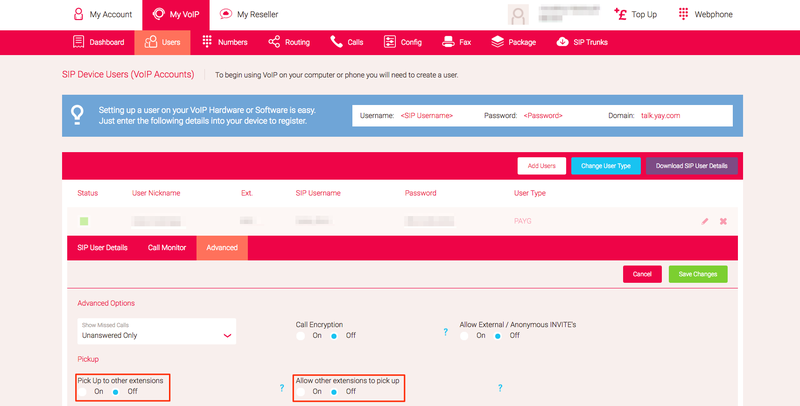 Home > VoIP Support FAQ > Cloud PBX > What is Call Pickup and how do I set it up? What is Call Pickup and how do I set it up? What is call pickup and how do I enable it? Call pickup is a feature that you can use where you can pick up a colleague's phone that is ringing if they aren't at their desk without physically being at their desk! To activate this, you will need to head to Users, pressing the edit icon (pencil) next to a user > Advanced Options and set Pick Up to other extensions and Allow other extensions to pick up to ON! You'll need to do this for both or all users that you wish to pick up from! Once you have done that, you'll then need to head into Short Codes, click Add Short Code, and then select a number you'd wish to use, assigned the command 'Pick up an incoming call to another extension' to it and then click 'Save Changes' when you're done! Once you have done that, simply dial that shortcode and the extension of the phone who's call you'd like to pick up! For example, if there was a call on Extension 1001 that you'd like to pick up, using the example above, you would dial *151001!